The former retail kingpin was allowed to stick the knife into his ill-fated, handpicked successor Philip Clarke. 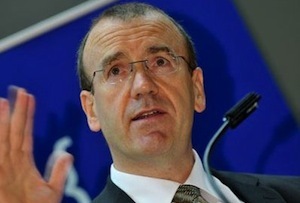 Tesco suffered from a ‘failure of leadership’ under Philip Clarke that ‘eroded’ customers’ trust and its reputation for cheap prices. That’s according to Clarke’s fêted predecessor Sir Terry Leahy anyway, who stuck the knife in on a BBC Panorama investigation into Tesco’s recent travails last night. ‘People tried very hard to do the right thing, it clearly has not worked. In the end that's a failure of leadership, not a failure of the business, not a failure of the people who work hard every day in the business,’ he continued. Harsh words, but then Leahy, who built Tesco into a global business worth £40bn during his 14 years in charge and won MT’s Most Admired Leader award a record eight times in the noughties, wasn’t exactly going to take the blame for the haemorrhaging sales since he stepped down in March 2011. Nor for the £263m profits black hole discovered in September just as new chief executive Dave Lewis took charge, and now being investigated by the Serious Fraud Office. Nonetheless, the Beeb should have given Leahy, who clearly now has one nervous eye on his own reputation, a harder time. After all, the Liverpudlian personally picked out Clarke to succeed him. Moreover, he left behind the toxic legacy of American business Fresh ‘n’ Easy, which Clarke exited in 2012 at the cost of £1bn and a huge amount of senior management time that should have been devoted to its largest market – the UK. And the programme spoke to suppliers who were effectively bullied by Tesco in the mid noughties, during his reign. Why was he not asked about the 'culture' that created? Presumably Leahy only agreed to the interview on the grounds that he wouldn’t be faced with such inconvenient truths. The omission, though, was glaring. The other interesting revelation from the programme was that Tesco had a mega fallout with cosmetics giant L’Oreal, which has a market capitalisation of €80.9bn (£61.9bn), making it more than three times the size of Britain’s largest retailer. L’Oreal refused to pay almost £1m in various charges, fees and fines, threatening to pull its products from Tesco’s shelves and take the supermarket to court. The argument was eventually settled behind closed doors, but it shines an uncomfortable spotlight on the lengths Tesco went to to squeeze suppliers for extra income (from fees for prime shelf space to rebates and discounts) as the pressure on its core business built. And that was what opened up the profit black hole, as supplier income was pulled forward and costs delayed. Lewis, meanwhile, has promised to ‘reset’ the supermarket’s relationship with suppliers. He’d probably rather Leahy and Clarke weren’t slinging mud at each other as he does his level best to turn the tanker round.